In this updated overview, you’ll see gorgeous book-style iPhone covers that will turn your precious device into a small book of wisdom. 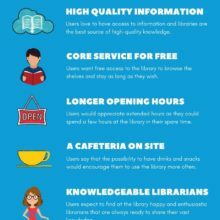 Even if you don’t feel like spending a couple of minutes in a queue with a good book opened in an e-reading application on your iPhone, you can still express you are a book lover. 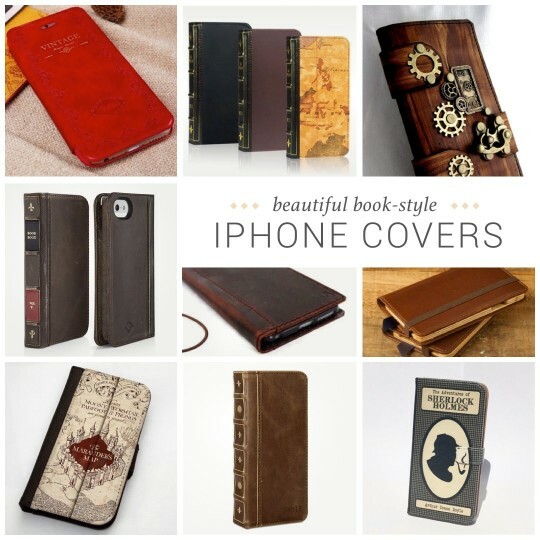 In the list below, you’ll find the best book-style iPhone covers. Each one would turn your precious smartphone into a small book of wisdom (which, in fact, every smartphone is). All the cases listed below open like a real book, are made of a vintage-looking material, and give that exceptional feeling of holding a precious thing. Unlike tablets, the smartphone cases have to be tailored to the particular model. Corner straps – so popular in book-style iPad covers – can’t be used because they will be covering the screen. Plus, when the case is oversized by only a millimeter, it may considerably increase the bulk it adds to the iPhone. Usually, the mechanism that keeps the iPhone in place is a precisely adjusted plastic shell. Therefore, each time the new iPhone is launched, case producers have to modify the design or create the new one from scratch – precisely cut to the new dimensions and positions of the buttons and ports. The dimensions of the iPhone SE (as well as the position of buttons and slots) are exactly the same as in the iPhone 5S. It means any case that was designed specifically for the iPhone 5S will also fit the new model. Last thing before the list. If you won’t find the perfect iPhone case in the list below, don’t hesitate to explore the following sites. Amazon – this is the largest online store, and if you are looking for an iPhone case alone, you’ll find here more than 2 million results! 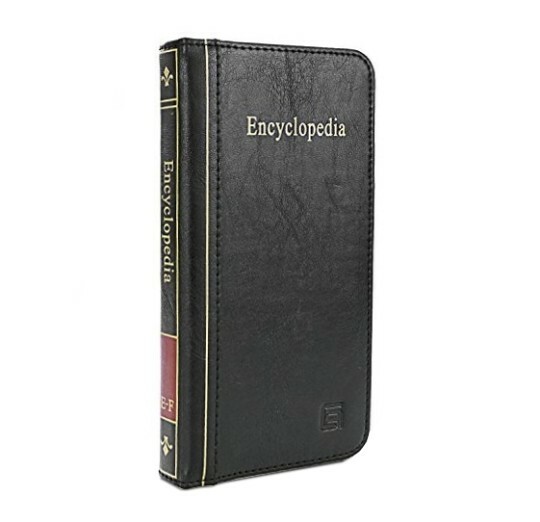 There are many book-style cases here, from premium leather cases to affordable faux leather alternatives. 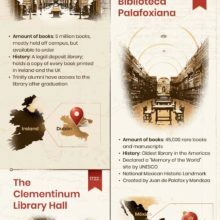 Redbubble – site offers hundreds of wonderful designs that refer to books, libraries, and reading. You can get most of these designs on a custom case or skin for iPhone. Portenzo – just have a look and you’ll fall in love with these beautifully handcrafted designer cases. iPhone cases are offered in limited editions, but there are several designs to choose from. 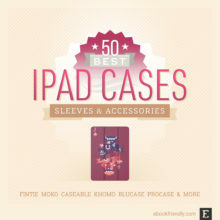 Etsy – a leading marketplace with hand-crafted goods includes a lot of stylish iPhone accessories. Not too many book-style covers, but plenty of sleeves and custom hard cases. If you know of any case worth adding to this selection, please leave a suggestion in the comment below. We’re usually updating the list at the time the new iPhone arrives, and new cases become available. Stay tuned. Mosiso Retro Book iPhone 6S/6 Case. 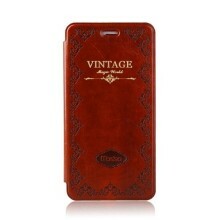 This slim, elegant case resembles a vintage book but doesn’t add too much bulk. Made from high-quality faux leather, it’s both portable and durable. It gives access to all ports, and can be transformed into a stand. The case is available in four color versions: Red, Brown, Gray, and Blue. ⇢ Amazon – $14.99. Mappy Art Book Leather iPhone 6S/6 Plus Case. 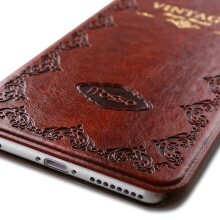 The elegant leather case is handmade from genuine leather. The hard case is holding the device in place while allowing access to all ports and buttons. There is the inside pocket for credit cards and cash. Mappy Art shop offers on Etsy also the versions for iPhone 6S/6 and iPhone 5. ⇢ Etsy – $34. 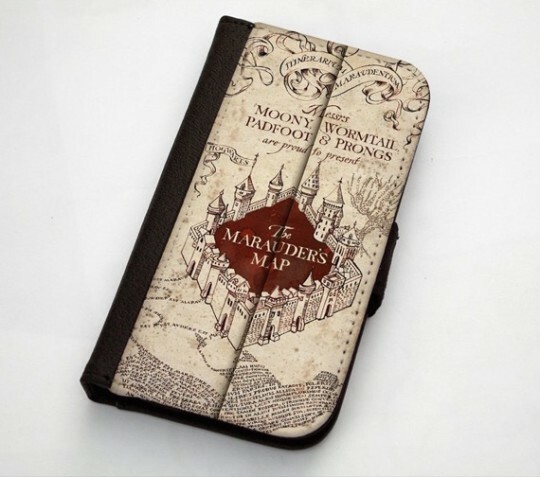 Harry Potter Marauder Map iPhone 5S/5 Case. Will fit also iPhone SE. 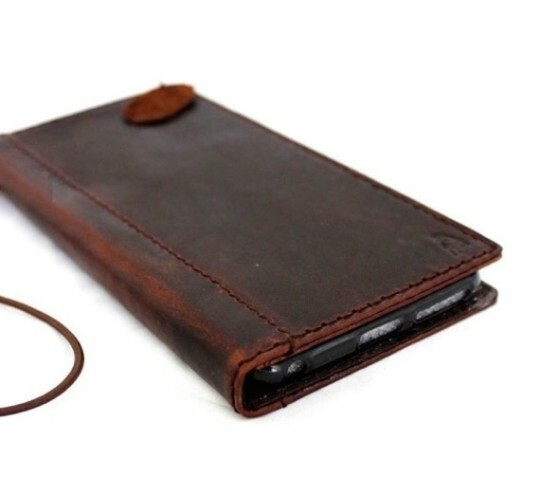 This hand-crafted case combines the iPhone case and a wallet. It features Marauder’s Map printed directly onto the fabric. Made from faux suede and soft PU leather, with a magnetic closure on back. There are also other Harry Potter inspired book-style iPhone cases sold by Little Brick Press. ⇢ Amazon – $22. 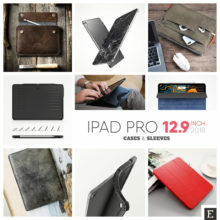 Twelve South BookBook for iPhone. For iPhone SE/5S, as well as 6/6S. 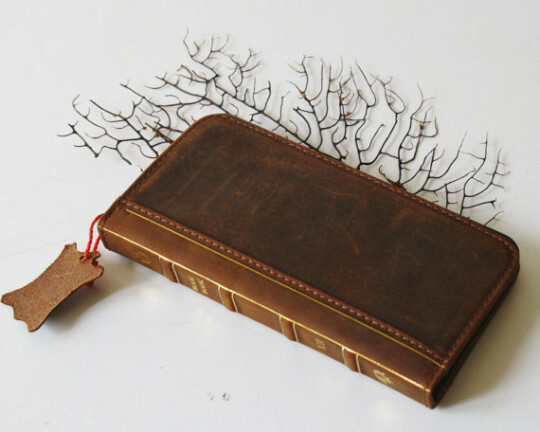 This hybrid wallet and iPhone case imitates a pocket-sized, vintage book. Open the beautifully designed leather book and you’ll see a wallet on the left and a leather wrapped frame that securely holds your iPhone on the right. The case includes pockets for ID, cards, and cash. Twelve South BookBook is available in two colors: Classic Black and Vintage Brown. 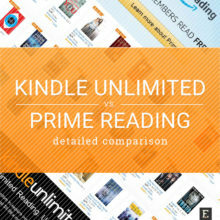 ⇢ Amazon – $49.99. 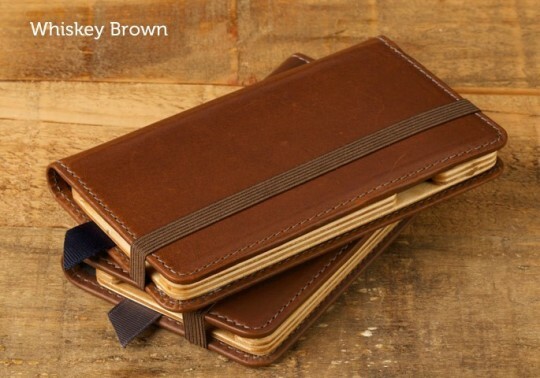 Pad & Quill Luxury Pocket Book for iPhone 6. There is also a size for iPhone SE & 5S/5. Handcrafted from luxury full grain American leather. Inside, there is a beautiful real wood cradle for rugged protection. The improved card pocket can now handle more items but still lays flat. Pad & Quill’s iPhone 6 covers are available in three interior colors: Dark Chocolate, Galloper Black, and Whiskey Brown (shown above). ⇢ Pad & Quill – $89.99. BoxWave Classic Book iPhone 6 Case. Fits iPhone 6S/6 and 6S/6 Plus. 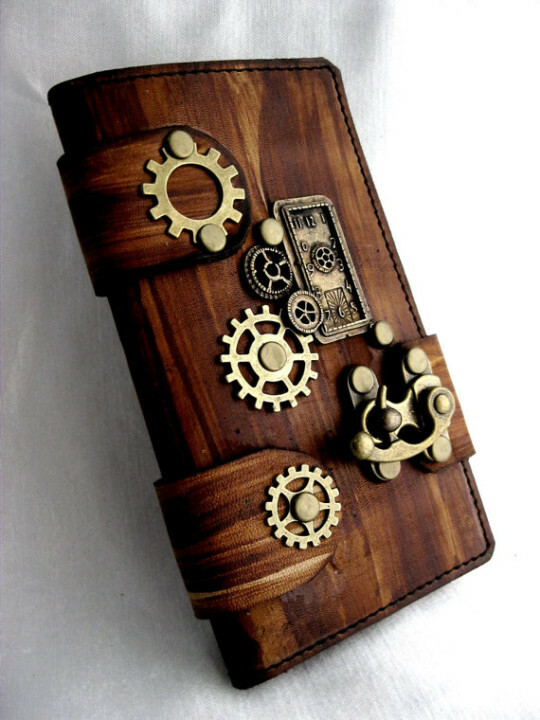 Genuine leather wallet-style case in the shape of an old-fashioned weathered book. A hard, durable front and back cover are combined with the interior lined with soft suede material to protect the iPhone against bumps and scratches. Features three built-in card slots. There are two colors to choose from: Gray, and Brown. ⇢ Amazon – $33.99. 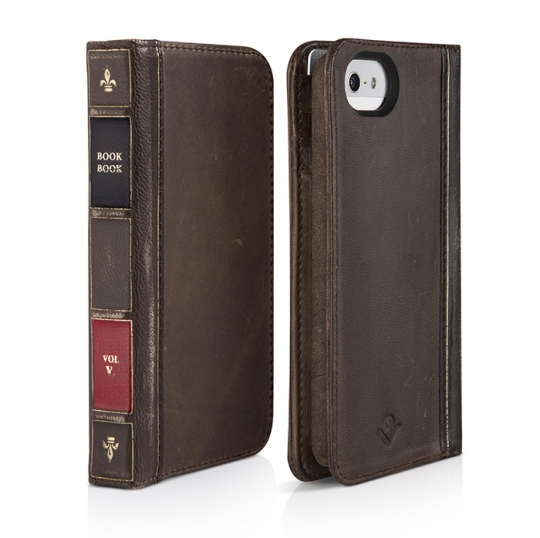 Eco-Fused Vintage Classic Book Case for iPhone 6S Plus and 6 Plus. 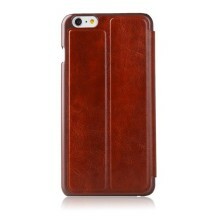 This nicely designed faux leather case will cover your iPhone with style. It features a wallet on the left and a slot for the iPhone on the right. The case comes equipped with a stylus and a microfiber cleaning cloth. There is also a version for iPhone SE/5S/5. ⇢ Amazon – $14.99. Totems Crafts Rustic Book-style iPhone 6 Cover. This rustic case featuring gear emblems was made from hand-dyed, waxed vegetable leather. It closes with brass C-hook swing clasp and has two large slots for credit cards and cash. There are several iPhone 6S/6 covers to choose from in the Totems Crafts shop. ⇢ Etsy – $92. Shop Leather iPhone 6S/6 Case. The case is handmade from real leather. It includes wallet pockets for IDs, credit cards, and other essentials. It can be transformed into a horizontal stand. ⇢ Amazon – $44.99. Shieldon iPhone 6 Case. 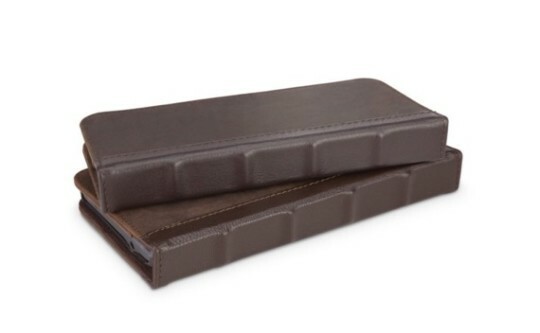 Made from 100% genuine leather, the case combines a wallet, ID & credit cards holder, and a stand. Built-in elastic cord closure will guarantee your essentials won’t fall out. Available in two colors: Brown and Black. There are versions for iPhone 6S/6 and iPhone 6S/6 Plus. ⇢ Amazon – $25.99. There are three stitching colors to choose from: Black, White, and Red. ⇢ Etsy – $99.99. 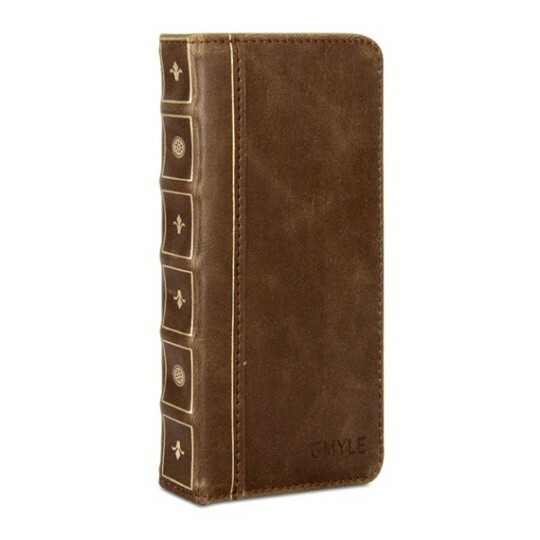 Gmyle Vintage Book iPhone Case. Versions for iPhone 6S, 6, and 6 Plus. 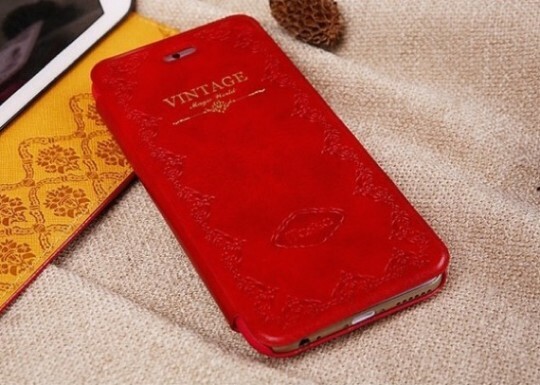 The cheapest vintage-style iPhone case we’ve found. It’s made from high-quality faux leather and includes wallet pockets for ID, cards, and cash. 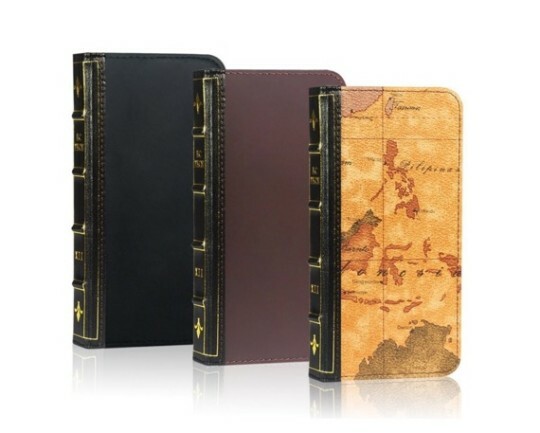 There are five design versions: Brown, Black, Bamboo, Walnut, World Map, and Brown & Black ⇢ Amazon – $9.98. Chic-Lit Designs Sherlock Holmes iPhone Case. Size versions for iPhone SE, 6S/6, 6S/6 Plus, 5S/5, 5C, and 4. 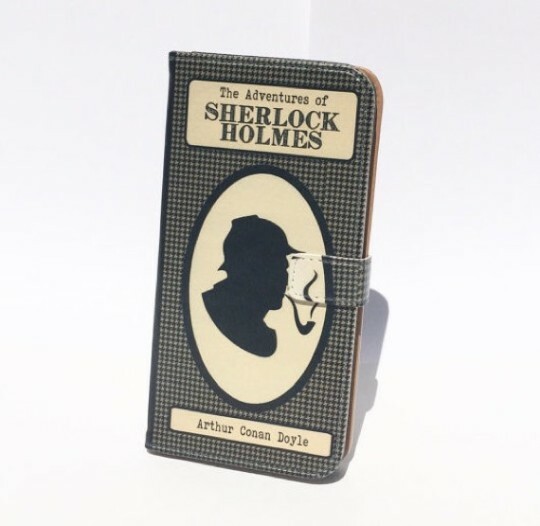 This durable case has been handmade to resemble the Sherlock Holmes book. It has an inside pocket for cash and cards and a magnetic snap. There are over 20 other classic book covers in the offer. ⇢ Etsy – $29. EC Technology Book-Style Case for iPhone 6S/6 and 6S/6 Plus. 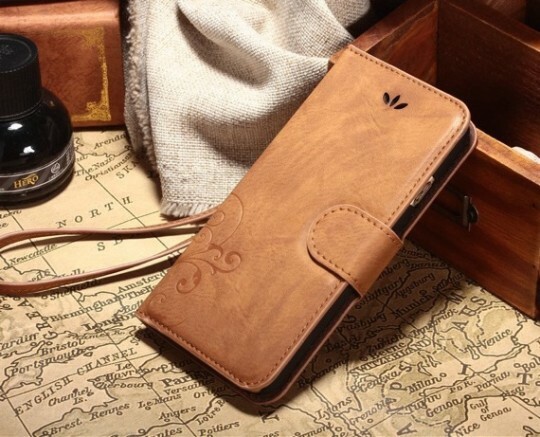 It’s a handmade, genuine leather case, both extremely stylish and durable. Your iPhone will be protected against scratches, dirt, and daily wear and tear. Includes wallet pockets for ID, credit cards, and cash. Available in three colors: Classical Brown, Matte Black, and Map Pattern. Available also for iPhone 5. 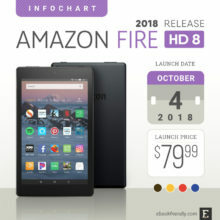 ⇢ Amazon – $8.99. 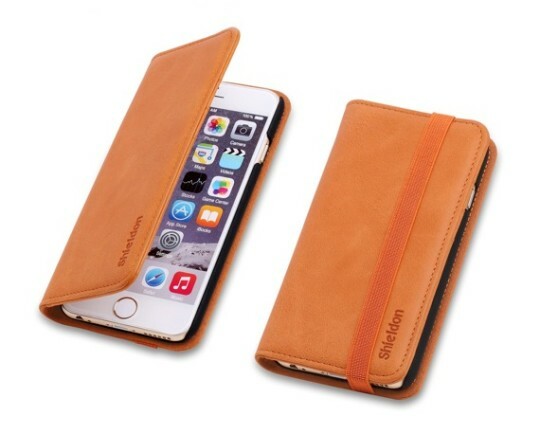 Aco-Uint Book Wallet Case for iPhone 6S/6 Plus. 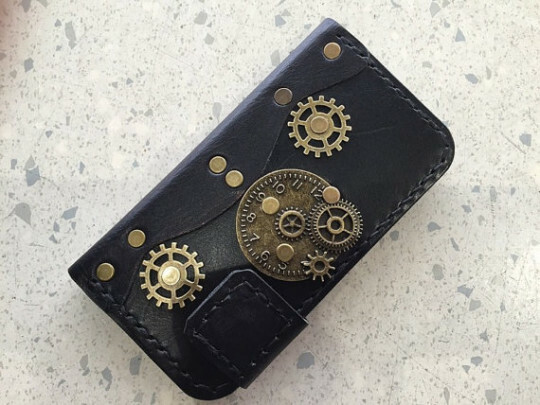 A series of wallet iPhone cases includes a few book-style designs. They are made of high-quality faux leather and have an inside pocket for essentials – while still being slim and lightweight. Available in several colors, including Khaki (shown above), and Dark Brown. ⇢ Amazon – $12.99.